With CTA Chairman Terry Peterson (c.) and Ald. 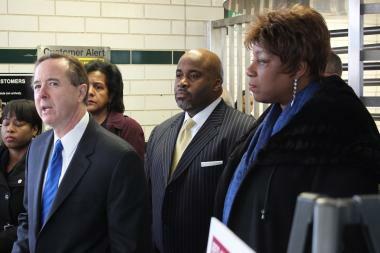 Pat Dowell (r.) looking on, CTA President Forrest Claypool explains the service changes intended to address the Red Line reconstruction project. WASHINGTON PARK — The CTA will allow riders to board "L" trains for free at the Green Line's Garfield station as a way of easing the inconvenience caused by the Red Line reconstruction project along the Dan Ryan Expy. this summer, officials said Thursday. Once the five-month project starts on May 19, trains will use the Red Line tracks as far south as Roosevelt, where they will divert to the Green Line. Southbound Red Line trains will use Green Line tracks to Garfield, where they'll head west on the spur that ends at 63rd Street and Ashland Avenue. Green Line trains will branch off at Garfield and take the eastern spur to Cottage Grove. Riders will be able to board trains for either line for free at Garfield during the project, CTA President Forrest Claypool said at a news conference at the station Thursday. 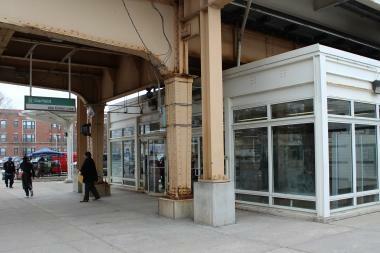 During the five months of Dan Ryan Red Line reconstruction, the Green Line Garfield stop will become a "free station." The CTA will run free shuttles between the Garfield station and the Red Line stops at 69th, 79th, 87th and 95th streets, along with another shuttle that will stop at those four Red Line stops and at 63rd and the Ryan. Claypool said he expects traffic at the Garfield station to increase tenfold, from 1,300 passengers a day to 13,000. A larger bus turnaround lot is being built to ease congestion. The CTA is adding 400 bus drivers to handle the increased traffic on both established bus lines and the shuttles. Chicago is adding 100 traffic aides as well to help smooth traffic snarls associated with the project. The CTA also will run express shuttle between the Chinatown stop at Cermak Road and the Roosevelt Road L stop. White Sox fans and Bridgeport residents used to taking the Red Line to 35th Street will simply have to walk the extra few blocks from the Green Line stop at the Illinois Institute of Technology. Sox fans also can opt to take a Metra Rock Island Line train to the new 35th Street station from downtown. The CTA is replacing the Red Line tracks and the entire rail bed down the center of the Dan Ryan. The so-called Red Line South branch was opened in 1969, and the track was expected to last 40 years. Once completed, the new track will eliminate slowdowns, Claypool said, and cut travel times between downtown and 95th Street by as much as 10 minutes. CTA Chairman Terry Peterson said that the Red Line South was the only branch to see reduced ridership in recent years, and he expects ridership to rebound when the project ends in October.